With Ultimaker PC (polycarbonate) filament, you can print strong and tough parts that retain dimensional stability when subjected to temperatures as high as 110ºC. PC is a perfect filament for printing moulds, tools, functional prototypes and parts for short-run manufacturing. With Ultimaker PC (polycarbonate) filament, you can print strong and tough parts that retain dimensional stability when subjected to temperatures as high as 110oC. Our PC is a perfect filament for printing moulds, tools, functional prototypes and parts for short-run manufacturing. 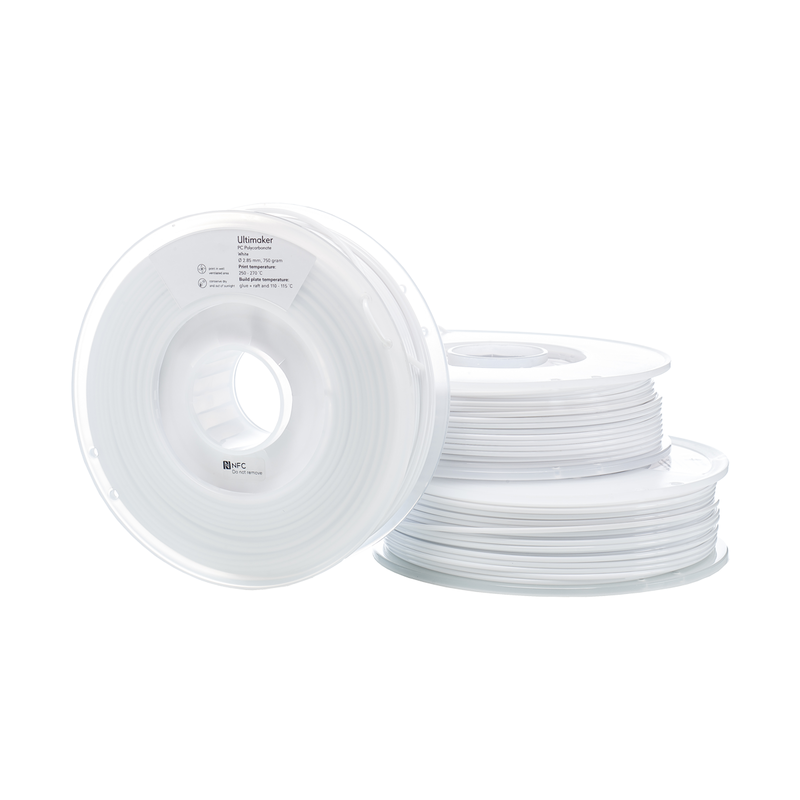 The Ultimaker PC filament has high strength, toughness, and heat-resistant properties. The best printing quality is obtained when used in combination with Cura’s extensively tested material profiles. It’s a great choice for a variety of applications, ranging from mechanically strong outdoor fixtures to aesthetically appealing lampshade designs. ABS (Acrylonitrile Butadiene Styrene) – the second most used 3D printing material. ABS is strong, flexible with a high-temperature resistance. particularly suitable for tools, toys and all kinds of utensils. Ultimaker ABS is perfect for the Ultimaker range of printers. CPE/PET is recommended as THE intermediate printing filament. It’s versatility with great mechanical and thermal performance. Natural PET has the highest level of optical clarity in the plastics world and is FDA approved food safe. PET (Polyethene Terephthalate) is the most common thermoplastic polymer resin of the polyester family, commonly used for food containers and water bottles. PET is gaining popularity due to it is easy to use and engineering properties, it is also easily recyclable.